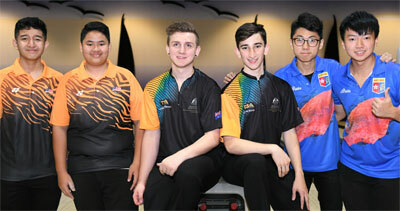 14th November, Kuching: Lachlan Stephenson and Callum Borck bagged the Boy's Doubles gold medal on the second day of the 18th Asian School Tenpi Bowling Championships for Australia A Team at Megalanes Sarawak. Defending champion, Ivan Tse and Alex Yu of Hong Kong Team A got off to a cracking start with an almost record-breaking game of 536 to take a 63 pin lead over Singapore B team second pair of Keefe Tan and Eugene Yeo in second. The Hong Kong pair added a superb 475 in their second game to extend their lead slightly to 79 pins as the Singaporean pair continued to trail in second. Two Australian pairs stayed in close contact with the leading duo in third and fourth. 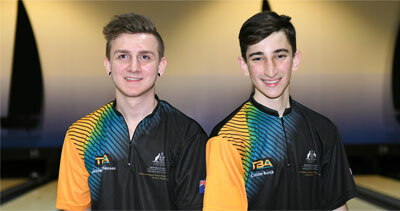 Although Tse and Yu managed only 363 in the third game, none of the title contenders took the oppotunity given to them with the first Australia Team A pair of Cullum Borck and Lachlan Stephenson 66 pins behind the leader. Hong Kong recovered with 452 in the fourth game but again stumbled to a lowly 379 in the fifth allowing the Aussie pair to take over the running and moving 50 pins ahead of Hong Kong. Muhd Hazim and Singles silver medallist, Ahmad Azriq of Malaysia A Team moved up into third. Borck and Stephenson ended the block with 441 to seal the gold medal with 2696. Muhd Hazim and Ahmad Azriq downed 453 to clinch the silver medal with 2625 while Tse and Yu settled for the bronze medal with 2623. The other Malaysian A Team pair of Muhd Arif Iskandar and this year's Asian Youth Singles gold medallist, Tun Ameerul Hakim missed the podium by a big margin of 60 pins to finish fourth with 2563. The girls will take to the lanes after oiling and Singles medal ceremony to contest their Doubles event. Competition will shift to the Team of 4 event in two blocks of 3 games each tomorrow.